In addition to the above presentation, there will be a 1-PDH presentation by Savin Engineering which will include an overview of their 2015 improvement project of the New Rochelle wastewater treatment plant, which was one of the largest projects undertaken in Westchester County and won the Project of the Year Award by the Weschester Chapter of the New York State Society of Professional Engineers (NYSSPE). The plant serves a population of 65,000 residents of the City of New Rochelle, the Town of Mamaroneck, the Village of Larchmont and the Village of Pelham Manor. The project has been a success delivering excellent nitrogen removals, and was on time and within budget. The BAF process has exceeded performance expectations and has reduced the Total Nitrogen (TN) discharge from the plant from approximately 2,000 lbs./day in 2014 to approximately 200 lbs./day in 2015. The plant has been in compliance with NYSDEC nitrogen discharge limits since January 31, 2015. 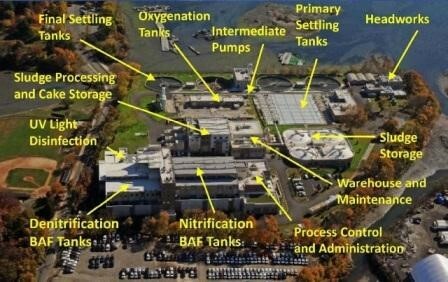 The improvements to the New Rochelle Wastewater Treatment Plant were designed to address the State’s permit conditions, required modification of the existing facilities as well as the construction of several new facilities. Among the new facilities, the improvements included: New nitrogen removal facilities, new ultraviolet light (UV) disinfection system, expanded secondary treatment tank capacity and additional sludge thickening capacity. There are still a limited number of seats remaining for both of these presentations at the April 14th event. Registration and refreshments will be starting at 5;30pm and the presentations will begin at 6pm. The event is being organized by both the NYC Chapter of ASME and the PEs in Construction Group of NYSSPE. The National Grid Center is located at One Metro Tech Center, Brooklyn, NY 11201. The building is located on Jay Street across the street from NYU-Poly.